So you’ve decided to go veggie! Well done! You’re on the way to eating a more varied, kinder diet; kinder to you and your body, kinder to animals and kinder to the planet. But if you’re not eating meat, what are you going to eat? We thought it might be useful to put together some ideas for a new veggie shopping list and also some pointers for eliminating any false friends that are lurking in your cupboards, things that look veggie but aren’t. Below you’ll find listed some vegetarian staples, veggie alternatives as well as some suggested dairy free or vegan options. I hope it makes it easier for you to switch to a vegetarian diet and find your way around the supermarket! First things first, go through your cupboards and clear out anything that isn’t suitable for vegetarians: look out for tinned soups, sauces, noodles (quite often have chicken stock), stock cubes (check the ingredients), Bovril (may seem like a strange one but I have seen this in two veggie households that didn’t realise it was made from beef! ), and Worcester sauce (often contains anchovies). You may find that you have yogurts in the fridge that contain gelatine (firming agent derived from bones) and are thus not veggie or cheese that contains rennet (enzyme found in the stomach of cows). Jelly is usually made from gelatine, mallow biscuits (Mikado, Kimberly) and sweets (flogs, marshmallows) also all contain gelatine. Look at what you have, check the labels and don’t bin what you don’t want – pass any non-perishables on to family, friends or charity! So now what, what does one fill one’s cupboards with? Store Cupboard list is for staples that you can’t do without! Things that have long use by dates and that you can use to make meals out of what seems like nothing. Keep a variety of grains and cereals. Try switching to wholegrain pasta and rice. Try Quinoa, cous cous. 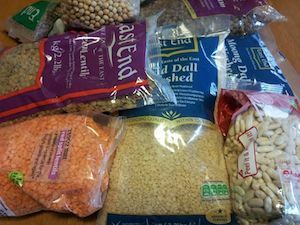 Dried lentils, beans and pulses. Split red lentils are cheap, protein filled and quick to cook. Green lentils and brown lentils can also be cooked without soaking so are useful to have in the cupboard. Dried beans are very cheap and available from most supermarkets and health food shops. Tinned kidney beans are cheaply available from most supermarkets from €0.20 a tin. Aldi, for example, stock cheap tinned chick peas and beans. Tesco usually stocks tinned green lentils. Supervalu usually has a good variety of tinned beans. Tinned tomatoes, cartons of passata, and tomato puree are available readily in most supermarkets. Dried Herbs and Spices – basil for tomato sauces, curry powder. One can use a lot of cumin, coriander and turmeric for curries and spicy soups. Seasoning – salt, pepper, vegetable bouillon or stock cubes. Nutritional yeast flakes are high in B vitamins and useful for vegans. Marmite, peanut and other nut butters, jams and fruit spreads. Spread Butter, vegetarian margarine or dairy-free alternatives like Pure dairy-free spreads. Yogurts. Most are vegetarian but check for gelatine which appears in many fat free or low-fat yogurts. If you’re avoiding dairy, Alpro Soya do a range of dairy free desserts and yogurts. Tesco also have own brand dairy-free yogurts and desserts which are suitable for vegetarians and vegans. Milk. If you are eating dairy just stick with your milk. If you are avoiding dairy, there are many alternatives on the market from nut milks to soya milks to coconut milk, oat milk, and rice milk. You can pick up soya milk from most supermarkets. Cheese. Check the pack for rennet – some cheese is firmed by adding this product which is not suitable for vegetarians. Soft cheeses are usually fine for vegetarians, but check the labels! If you want to try dairy free cheese, they are usually available from health food shops – I haven’t yet seen them in mainstream supermarkets. It is available from around €2.99 a packet. Cream. Following a vegetarian diet, cream is fine. If you are going dairy free, try Alpro soya cream, 99c a carton and available in most supermarkets (it doesn’t whip but it’s fine for use in cooking and for pouring). Other cream alternatives are available from health food shops. Handy to have some ready made jar sauces in the cupboard. A very quick meal would be to add Quorn pieces (if you’re vegetarian) or a drained tin of pulses with some veggies to a sauce, heat and serve with rice or naan bread (or roti if you’re vegan). Most ready made Indian style sauces will be okay for vegetarians and vegans (Lidl sauces are cheap and cheerful), check the labels for dairy (korma contains cream) and any added animal stock. Italian tomato based sauces are usually okay, but watch out for pesto that contains Parmesan (Parmesan is never vegetarian). Meridian make a pesto that is suitable for vegetarians and vegans and is available from most Supervalus. Thai sauces often, but not always, contain fish. There are a couple of brands available in Supervalu that are veggie friendly. Worcester sauce; many contan anchovies but our own Irish Goodall’s is suitable for vegetarians. Some beers and wines are made using animal products to fine them. You can check most brands on this website. Marks and Spencer label their wines if they are vegetarian or vegan. Barnivore is a great resource for checking whether a brand is vegetarian or not. Tofu is smooth soya bean curd. 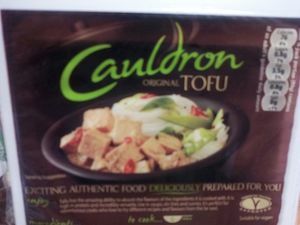 You can pick up Cauldron Orignal firm Tofu and Smoked variety in Tesco. Other brands of tofu are available from heath food shops. Firm tofu can be baked or fried. Tempeh is made from fermented soya beans and is available from Health food shops. In the early days of switching to a vegetarian diet, you may find it easiest to switch to vegetarian alternatives of food that you already enjoy. Quorn comes in a variety of shapes and sizes, sausages, mince, chicken style pieces and fillets. Just use them instead of meat. Veggie burgers are available from a variety of companies now, most supermarket chains have their own brands, try them out and find your favourite! Dee’s Wholefood products are Irish and are available in many supermarkets throughout the country. Linda McCartney has a range of foods available in most Tescos, Dunnes and Supervalus; her sausages and sausage rolls are vegan friendly. Aldi stocks a burger and a nut cutlet which are suitable for vegans. It’s not good to rely on pre-prepared or pre-packaged food but it is always handy to have something in the freezer for emergencies. When you are buying sweets and biscuits look out for gelatine, a lot of jelly type sweets contain gelatine and some red food colouring is derived from insects (carmines) and is not suitable for vegetarians. When you’re buying biscuits and cake, if the oil used is listed in the ingredients as margarine, there’s a good chance that means they have used animal fat (it’s cheaper) and not vegetable fat. Cakes may be made from eggs that are not free-range, if they are made using free range eggs the packaging will state it loudly! Some ice-creams contain eggs that may not be suitable for vegetarians. You can pick up ‘Swedish Glace’ dairy-free ice-cream from most supermarkets and there is a dairy-free Irish ice-cream ‘Nobo’, it is dairy-free but contains honey. Available from markets. Whey powder: You’ll see whey listed as an ingredient in all sorts of products like cheaper chocolate, some crisps and cakes. Whey is a bi-product of cheese production. If the whey used is sourced from a non-vegetarian cheese, then the whey itself is not vegetarian. Often, you won’t know if whey is vegetarian or not just from reading the label! Free-range eggs are considered vegetarian. If you don’t want to eat eggs, you can get an egg replacement from most health food shops. Orgran ‘No Egg’ is a brand often seen. A pack retails at about €4 and is equal to 66 eggs. Honey is considered vegetarian but is not suitable for vegans.